Most people don’t know that modern clocks run on “French Time.” There is only one clock in the world that runs on “Italian Time” and it is in the Duomo in Florence. 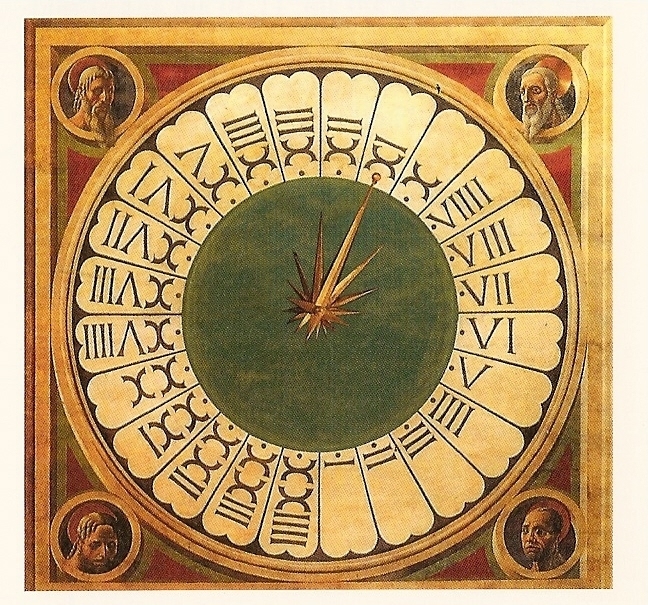 “Paolo made the colored sphere of the hours above the main door within the Church, with four heads, painted in fresco.” Giorgio Vasari, in his “Lives of the Artists” (1550), goes on to tell us that Paolo Uccello was paid 40 lire in February 1443 when he finished the face of the clock, decorated with the heads of the four Evangelists, on the inner façade of the front wall of Florence’s Duomo (cathedral). Uccello also designed the single golden shooting star-shaped hand that circled his fresco, denoting the time. Florentine clockmaker Angelo di Niccoló devised the clock’s first weight and counterweight mechanism. In the 17th century, Galileo Galilei designed a pendulum for the clock, improving the clock works. 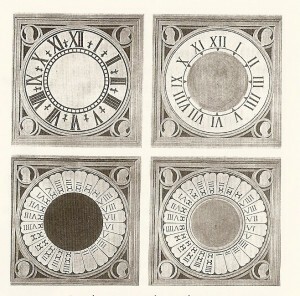 This is a most unusual clock to the modern eye, not only because the Roman numeral XXIIII (24) is at the bottom, but also the clock runs right to left (counter clockwise). The hand of Uccello’s clock moves like the shadow of a sundial or wall meridian- counter to the movement of the sun. This was entirely proper in the 1400s. It was not until the 17th century when there was international standardization of all European clocks to mandate left to right movement. A 24-hour clock is common in Europe (know as military time in the U.S.). 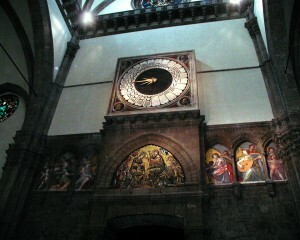 But the hour designated by the number 24 on the Duomo clock is not midnight, but is the hour of sunset. Sunset was a more important concept in the 1400s because that was the time that the gates in the high walls surrounding the city would close and all residents should be inside. The bells of the Duomo, timed to the clock, would ring at set intervals before sunset to warn farmers and others to stop work and head back inside the protective walls. The time of sunset changes, however, throughout the year. The clock is re-set each week so that the last hour of daylight always coincides with the Roman numeral XXIIII. Thus, the clock tells the observer how many hours have passed since the sunset the day before – the Italian Hour of the present day. For example: On November 4, sunset is deemed to be 5:15 and the clock hand will point to XXIIIi (24). On November 5 the clock will be at XVII (17) at 10:15 in the morning to show that 17 hours have passed since sunset. Italian Time is also known as “Julian Time” (per Julius Caesar’s reform) or the “Time of the Hail Mary” and was used in most of Romanized Europe, the Middle East and North Africa. The rest of Europe used “Ora Oltramontana” (“hour other side of the mountain” or Transalpine Time) or French Time, which counted time from twelve to twelve, calling the hours from midnight to midday “morning hours”, and the hours from midday to midnight “evening hours”, also know as Gregorian Time after Pope Gregory XIII (1583). 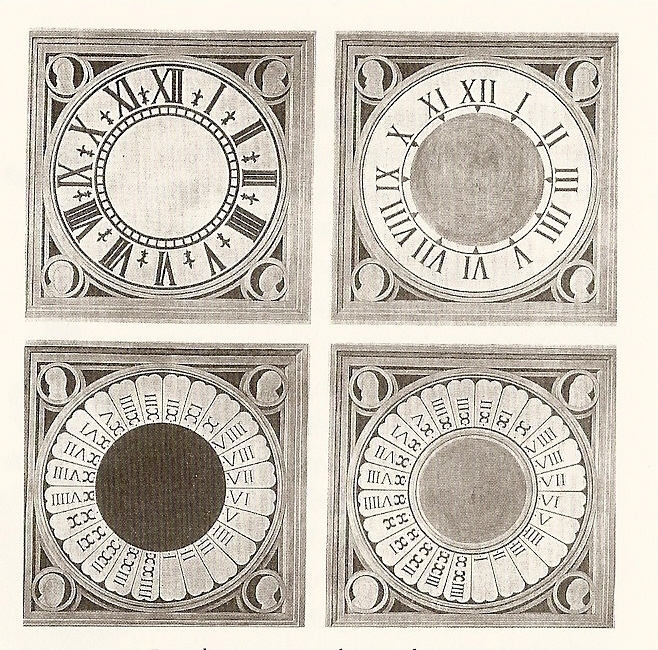 In 1669, the French system prevailed by international agreement and Uccello’s clock face was repainted to depict a twelve-hour clock. In 1968, a five-year restoration process was started and the twelve-hour clock face was removed. Underneath it another twelve-hour face was found and under that a 24-hour design by an unknown artist. By 1973, the original Uccello fresco was uncovered and restored to it former glory. The original gilded copper hand of the clock created by Uccello was lost when the new 12-hour design was implemented in the 17th century. Restorers went back to Uccello’s original “contract of work” in order to recreate his design – “For the gilding of the clock’s star and for the gilding of the single sphere at the point of the ray …” Restorers also examined the design of the Star of Bethlehem that Uccello had included in his stain glass window, located in the cathedral dome. Then, a new single gilded copper hand in the shape of a shooting star was devised to count the time on the clock. Since the 1980s, Lucio Bigi and Mario Mureddu have wound and reset the clock every week. They wrote a small book about the clock, “L’Orologio nel Duomo di Firenze” (The Clock in Florence’s Cathedral), published by Libreria Editrice Fiorentina this year. Visitors to the Duomo may want to step back in a few hours later on the day of their visit to observe the movement of the only clock in the world that keeps Italian Time. Fascinating article. Who would have thought you could trust a public Italian clock! Io orgogliosamente fiorentina, imparo tutte queste belle cose da un’americana! Grande! thanks a lot to rimind us these jewels often forgotten because less visited! This is not the only clock that is 24 hours and runs backwards.. The clock in the cathedral in Florence also does this. Enjoyed the article as the local guides are not familiar with the “why” of either clock. The profesional guides we had and even those working in the cathedrals could not explain why. Hello I found this post by mistake, I was browsing the worldwide web for dereon by Beyonce when I came upon your website, I must say your blog is really intriguing I just love the content, its astounding!. I don’t have the time at the moment to fully read your site but I have saved the location of it and also subscribed for your RSS feeds. I will be back when I have more time. Bravo for a awesome site. Did I misread something or did Archie Jordan. 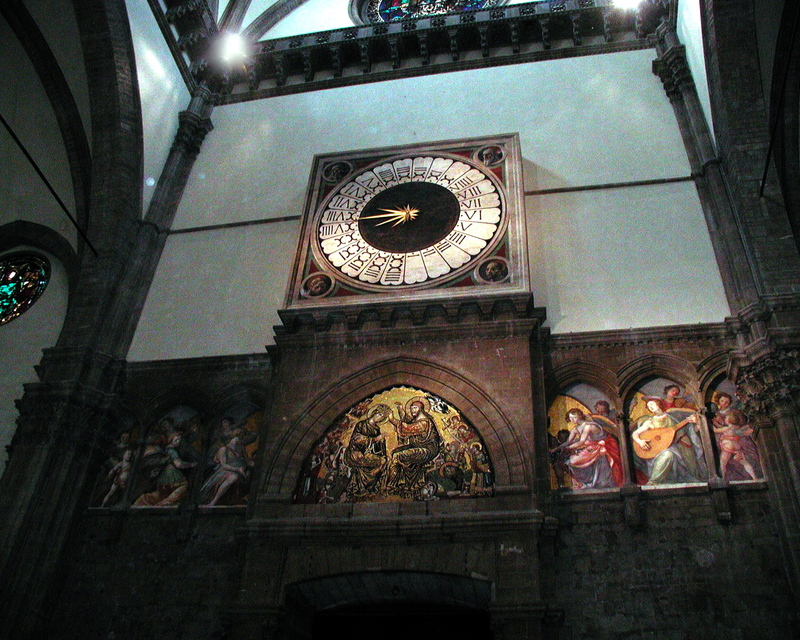 This article IS about the clock in the cathedral in Florence. I saw it when I was there a few years ago and was fascinated. Have told many friends about it. Glad I found your article – it explained it even more fully than the sweet little lady did when I was there. Dear Ann, so glad you are informing your readers about this. 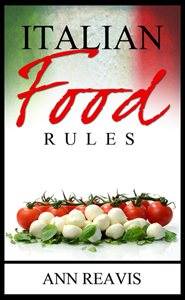 For further descriptions of Florence (and other Tuscan and Lazio cities) using the “old ” time system see my book “Travel to Tuscany & Northern Lazio” based on the travel diaries of Cardinal Henry Stuart, a VIP traveler. Available at BM Bookshop in Florence. Interesting. But I suspect wrong in a couple of details. 1. Sundials go clockwise just like normal clocks – indeed that’s why clocks go clockwise in the first place. 2. It strikes me that this clock doesn’t run anti-clockwise at all but just counts down the hours left to sunset, or noon, or midnight depending on what its makers wanted the bottom or zero on the clockface to represent. You’ll notice that the later clockfaces are conventionally numbered.